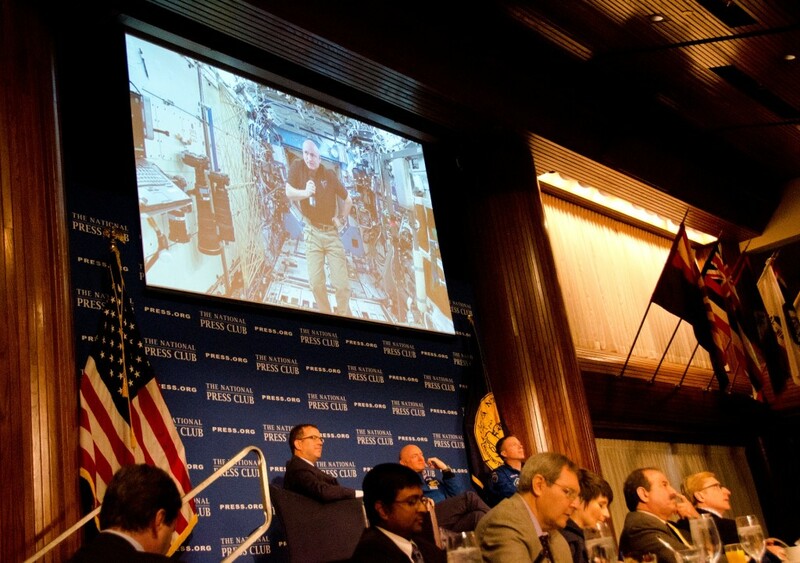 Astronaut Scott Kelly joins a National Press Club breakfast from space Monday. He said he was able to stand by securing his feet under a rail on the floor. Club President John Hughes, left, questioned retired astronaut Mark Kelly and astronaut Terry Virts, who urged the government to support a mission to Mars. SHFWire photo by Rebecca Anzel. WASHINGTON – NASA made news in early July when the New Horizons spacecraft recorded the first-ever close-ups of Pluto and inspired excitement in 2010 when it announced its goal to put a human on Mars. But Capt. Mark Kelly and Col. Terry Virts said at a National Press Club breakfast Monday that NASA must have the support of Congress and the White House to continue achieving important scientific feats and to go to Mars. To get that support, NASA needs to tackle areas of space that grab American’s interest. Kelly, a retired astronaut, said despite the U.S. having “the best scientists and engineers in the world,” space programs take a great deal of time to complete and sometimes Congress or a new administration cancels an ongoing program. One of those was the Constellation Program, a manned flight to Mars and a deadline to return to the moon, proposed by President George W. Bush. The Obama administration cut funding for it in 2010. 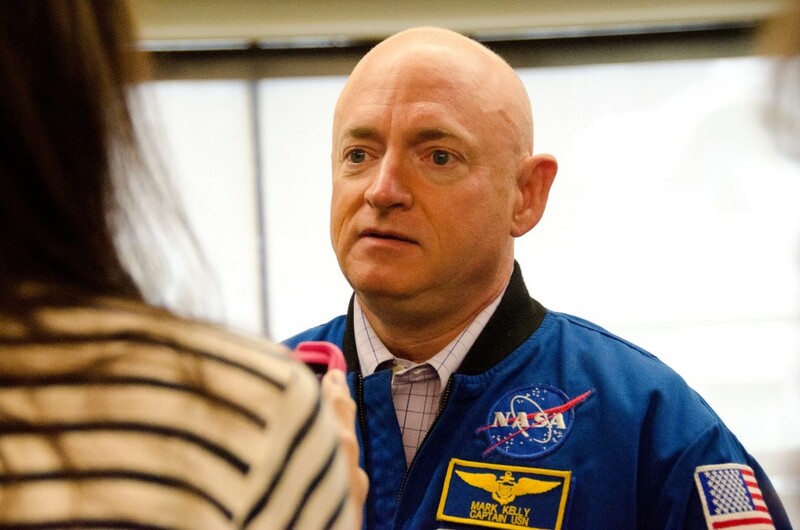 Mark Kelly answers questions about possible travel to Mars at the National Press Club on Monday. He gave two options for reaching the red planet: the slow way, which would take six to nine months, and would require a large supply of food and fuel, or a fast way, using a proposed nuclear reactor, to cut the time in half. SHFWire photo by Rebecca Anzel. The Obama administration has helped NASA reduce the cost of sending supplies to the International Space Station to less than what Russia spends. Although NASA hasn’t calculated the complete budget for a Mars mission, NASA spokesman Trent Perrotto said the agency asked for $2.9 billion for 2016 to move the program forward. NASA hopes to develop the technology to get a human on Mars in the 2030s and an asteroid by 2025, according to its website. In the meantime, employees are pursuing other projects. Kelly’s twin brother, space station Commander Scott Kelly, is a participant in NASA’s One Year Mission, which will end in March. Its goal is to test the effects of 12 months in space. Researchers are comparing Scott Kelly’s genes and physical health to his twin, a first-time opportunity for scientists, according to Mark Prentice, Mark Kelly’s media representative. Scott Kelly joined the breakfast by live video feed from space. He joked that after seeing a picture of his brother’s breakfast of bacon and eggs, he questioned who had the better role in the Twins Study. He said it was a privilege to be in space, but he was initially apprehensive about participating in such a lengthy mission. Kelly said one of the things he misses about being on Earth was being outside. He said even prisoners are able to get fresh air. Virts, who has participated in several space flights, said this is a common desire. On a previous mission, he said, he and his colleagues played rain sounds on their laptops. For a Mars mission to succeed, Virts said it will have to be an international effort to save money. That mission would be the first step in what Mark Kelly said would be the path for those in the younger generation to vacation in space. Reach reporter Rebecca Anzel at rebecca.anzel@scripps.com or 202-408-1489. SHFWire stories are free to any news organization that gives the reporter a byline and credits the SHFWire. Like the Scripps Howard Foundation Wire interns on Facebook and follow us on Twitter.